This is a very simple, sweet story. I honestly really loved the characterization of the husband and the cat (there are a lot of quickly introduced but not really plot integral secondary characters, but the three that are important are the husband, cat, and wife. Everyone else is just there for them to interact with, which is okay) but sometimes didn't get as much of a feel for the wife. That said, the husband was great and the cat was catly, which I'm a sucker for. The plot does rely heavily on flashbacks to convey the start and growth of a marriage which we see in crisis and some parts were kind of rushed over in a "telly" sort of way. Not a huge sin for a short book that basically takes place over a Christmas-Eve-Afternoon, but I would've liked to see some of the avenues explored about the decline of the marriage, rather than just seeing the adorable highlights. It might've helped me understand the wife's decision to issue an ultimatum a little better. That said, the adorable highlights were adorable and as someone who is enjoying a happy marriage, it was nice to see them portrayed and made it easier to root for the characters getting back together ... and it might be me as a military wife who has picked up and moved with my husband at the drop of a hat several times just not sympathizing with this being a breaking point for a marriage. However, I did read this in a few days and never regretted my decision to finish it. 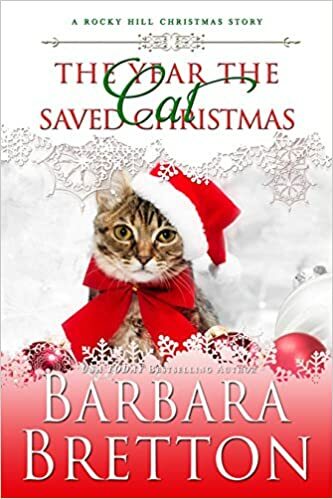 I think it is a good Christmas themed book that lifts up marriage and cats, two of my favorite things.